Germantown, MD – An inspection of Germantown Reproductive Health Services (GRHS) conducted last fall discovered that the late-term abortion facility had been operating without a current medical laboratory permit. 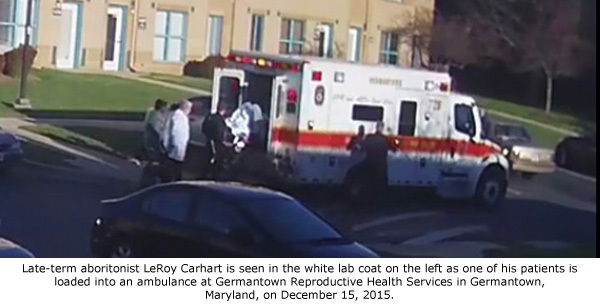 Late-term abortionist LeRoy Carhart, who is under investigation by the House Select Panel on Infant Lives, commits abortions at GRHS in Germantown, Maryland, throughout all nine months of pregnancy. Operation Rescue has obtained a copy of the inspection report dated September 25, 2015, that cites GRHS for failing to maintain a current medical laboratory permit. It allowed its permit to expire in August, 2013. The abortion facility was also cited for displaying an expired license. But perhaps more concerning was a citation for failing to ensure that GRHS employees were proficient in testing women for the Rh blood factor. This had the potential of affecting the health of patients and any future children that they might bear. The Select Panel on Infant Lives issued subpoenas to Carhart, GRHS, and seven other businesses and agencies earlier this month seeking documents related to the suspected illegal sale of aborted baby remains and the information related to babies who were born alive as the result of Carhart’s failed abortions. Carhart was ordered to appear for a deposition before the Panel on June 13, 2016. Adding to concerns that Carhart and GRHS is endangering the lives and health of patients and their babies is documentation of 14 medical emergencies requiring ambulance transport from GRHS and Carhart’s hometown abortion facility in Bellevue, Nebraska. This includes the death of abortion patient Jennifer Morbelli that resulted from complications to a 33-week abortion administered by Carhart in 2013.